Crisp wood-smoked bacon. Thick slices of juicy, vine-ripened tomatoes. Leafy lettuce with a slather of creamy mayonnaise. All brought together on toasted sourdough bread. Who doesn't love a BLT? In The BLT Cookbook, Michele Anna Jordan shares her passion and secrets for achieving a seductive harmony of flavors and textures that create the perfect BLT. The sixty mouthwatering recipes range from variations of the classic sandwich to soups, salads, and pastas, all inspired by what Jordan calls the holy trinity of tastes: acid, salt, and smoky, voluptuous pork fat. Serve up the Grilled BLT Kabobs at your next summer barbecue. Indulge in the tangy Watercress Soup with Currant Tomato Salsa and Bacon on a chilly afternoon. Impress your guests with the elegant Pappardelle, Bacon, and Zucchini with Warm Tomato Vinaigrette. Has all this talk made you crave the real deal -- stacked high with juicy tomatoes, crunchy bacon, and crisp lettuce? The Full-Tilt Boogie BLT will surely satisfy your hunger. In the mood for lighter fare? The Tomato Salad with Bacon Vin-aigrette delivers all the flavor of the BLT in a refined context. 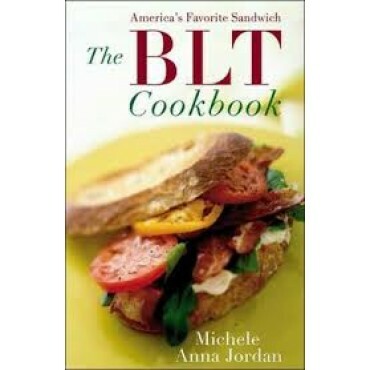 The BLT Cookbook also provides details on how to fry bacon, slice tomatoes, and select the perfect leaf of lettuce.